Today I would like to share with everyone something new, perhaps not your usual mooncake recipe, at least not in this part of our world. A pastry made in the shape of a flower, particularly Chrysanthemum, and thus the name 紫薯菊花酥. I made this twice, first version following the original recipe to the dot. While the second time I change the vegetable oil used in the pastry to ghee, hoping for a more flaking and golden finish to the pastry. Well, I can't say I achieved that because I still needed the egg wash to give it it's shine. Both version yield almost similar results, except that the one with ghee gave a more buttery scent. :) I will post the version using ghee, feel free to just replace it with vegetable oil which is what Carol used in her recipe. Divide into 10 portions, each portion 20g. Roll round and chill for easier wrapping later. Mix everything together till it comes together to form a soft dough. Divide into 10 equal portions, cover and let rest till needed. Then taking a swiss rolled dough and roll it out into a round and wrap with a sweet potato filling in it, making sure it seals up nicely. Repeat till all is wrapped up. Then gently press each sealed round to form a flat disc, careful not to break the seal. Using kitchen scissors, snip 12 equal portion slits on the sides of the disc leaving about 1" from the center. Then gently place it on the baking tray. Gently turn the slit sides face up, there should be 12 "petals" for each flower. Repeat for the rest of the 9 portions. Brush all the mooncakes with egg wash. 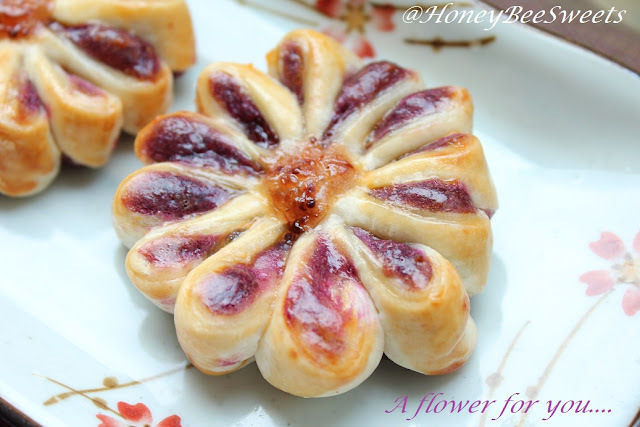 The place a small dollop of strawberry jam right at the center of each pastry. 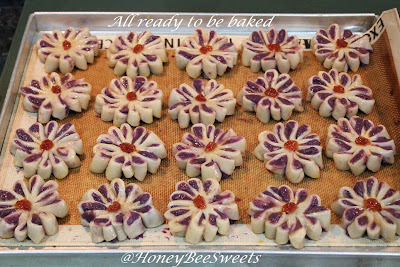 Bake in the oven for 16-18 minutes till the mooncakes are golden brown. Once out of the oven, you can again give it another egg wash coat to make it more shiny. Okay, before I go, just want to show you all what the other cutie that I made this festival. 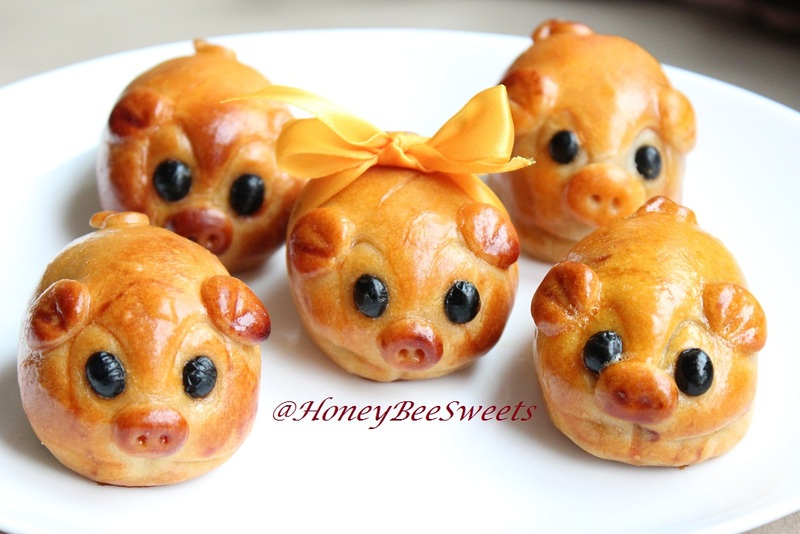 It's the handmade piggy mooncakes! Recipe compliments from Anncco, thanks so much Ann!! Okay folks! Have a great celebration on Mid-Autumn festival! Cheers! Finally, finally, finally,....I have been wanting to do something for this month's Malaysia Food Festival which features Sarawak. So busy, what to do? But! I finally did it! Yay! 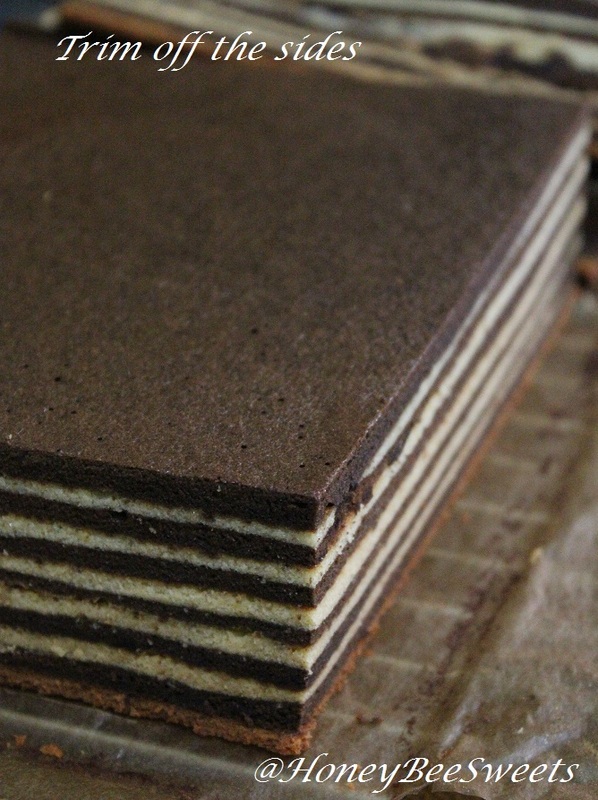 Frankly speaking, I have little to no knowledge of Sarawak food heritage except that they make fantastic lapis cake. ;)) Actually I am not sure if this recipe I made pass the criteria or not, ...try first die later, lol! 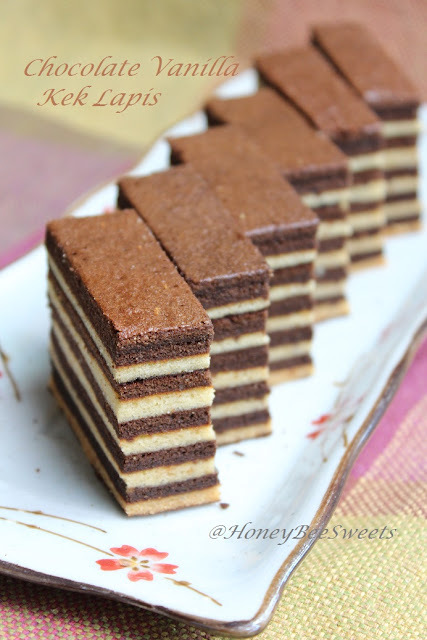 Introducing my post today....Chocolate Vanilla Kek Lapis! 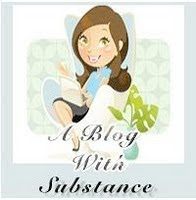 I have been eying on several lapis recipes online, particularly Rima's from Bisous À Toi. Her lapis are ALWAYS perfect...seriously. So I trust that her recipe will turn out great. So I decided to take a recipe of hers and make some changes to it. 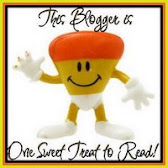 :) Thanks Rima for sharing your recipes! I have no problem baking this, its the time involved doing it....3 long hours standing next to the hot oven....*faint*. It is truly a bake with love and patience. Note that my version has reduced the sugar level so feel free to increase it if you like yours sweeter. For the egg yolk batter; Beat the butter and caster sugar till light and fluffy. 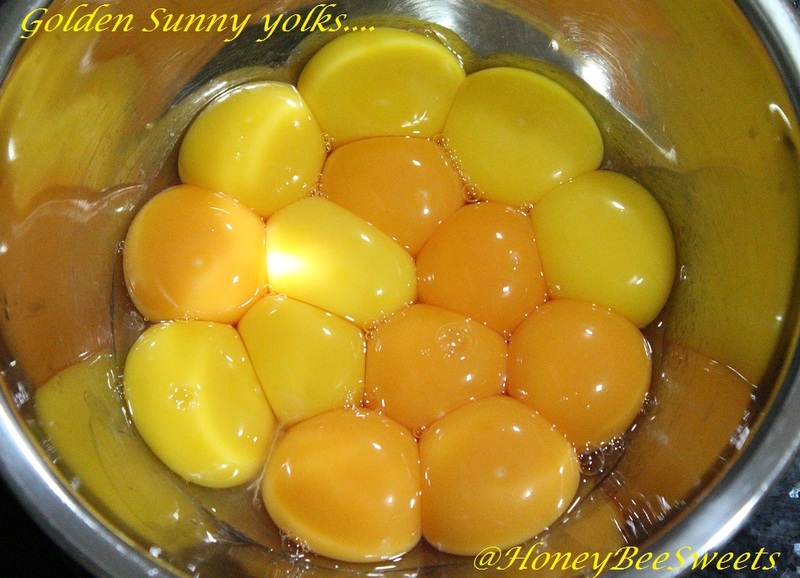 Then add the egg yolks one at a time, beat well to combine after each add. Lastly, add in the vanilla extract, stir well. Add in sifted dry ingredients. Stir gently to combine everything. Set aside. Preheat the oven to 180C at grill mode. Grease and line a 8"x8" square pan. In a large mixing bowl, beat the egg white till foamy, then continue beating and add in the sugar gradually. Continue to beat till stiff peaks. Add 1/3 of the white to the yolk and mix well. Then gently fold in the other 2 portions and be sure not to deflate the white. One portion of the batter, add in the chocolate flavoring mixture. Stir well. Weigh out 100g (Rima did 70g) for each batter. 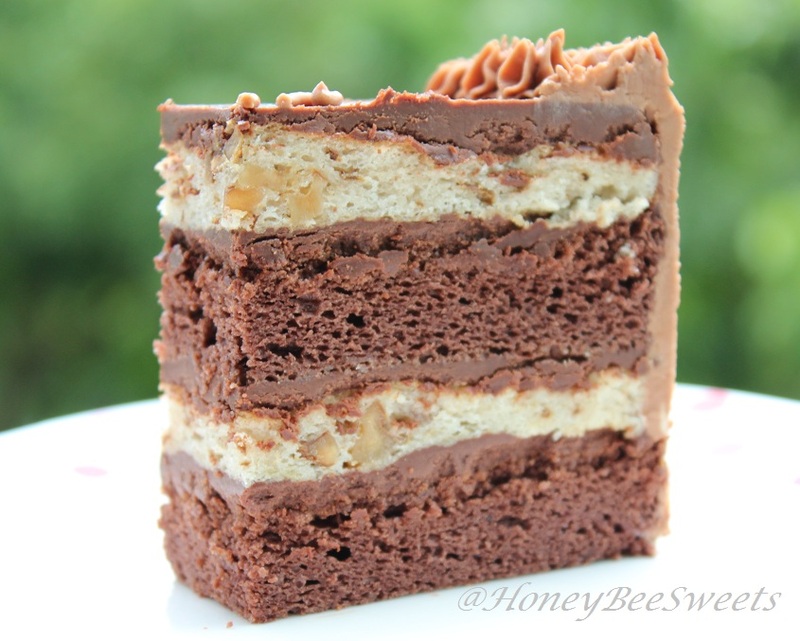 Bake one layer at a time for 7 minutes and alternating the flavors. Give the cake a gently press all round when it comes out of the oven. Then add on the next layer. The last layer, bake at 170C normal oven mode (both top and bottom heat) for 10-12 minutes. My impression of lapis cake is it's greasy...perhaps those I ate from store bought are. But I was very please that mine turned out perfect, no greasy / oily feel on the hands or in the mouth. 250g butter for a 8"x8" square pan ain't that much if you ask me. The chocolate flavor is more prominent then vanilla, which is no problem for me because I love chocolate! Actually I have to thank my BIL for sending over a tray of 30 eggs over a couple nights back. If its not for those big pretty eggs (which I have no room in my fridge), I wouldn't have bake this lapis cake, hahaha! 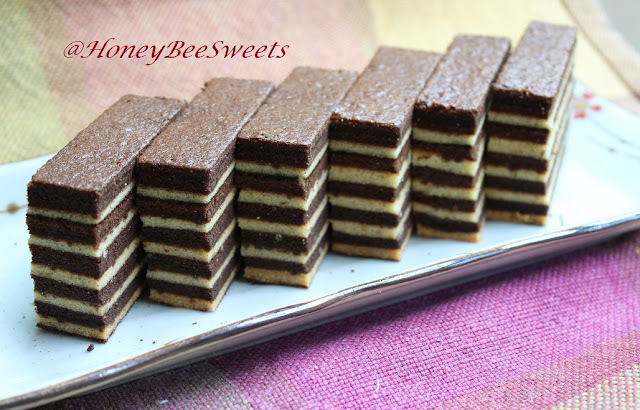 My family love this cake, chocolaty, nice texture and not too dense, since it did use the egg separation method. Next time I would love to try out with Mocha flavor, should be yummy! Okay, got to run...am so late! See you all soon! It has already been 10 days since my last post here...don't get me started on the backlogs. 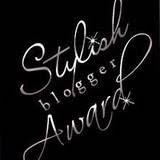 :P. In fact this will be my first time using this new blogger interface...hope everything goes smoothly. 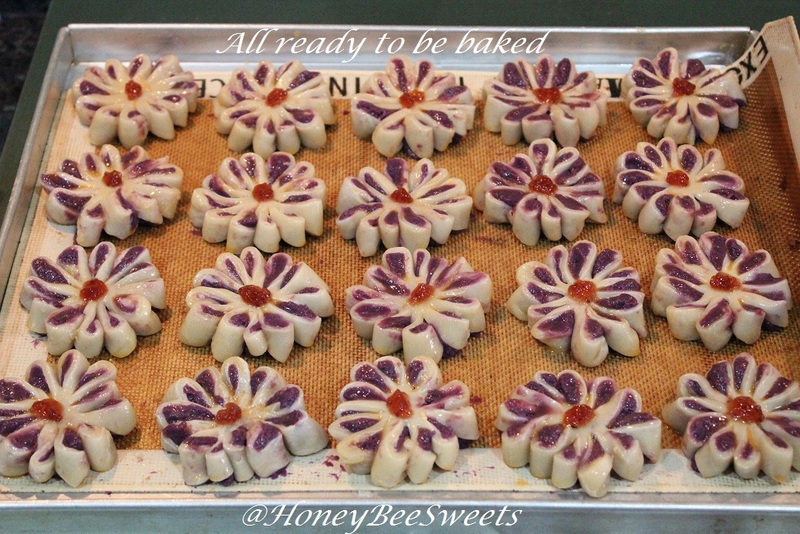 :P Have been baking mooncakes non stop for the past week....kinda crazy but overall a fun project. 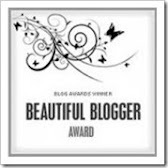 Glad it's over now, and I finally get to do some blogging. ;) Besides the mooncakes, I still managed to bake my dear husband a birthday cake as well. (it almost sound like it's less important, haha!) ;P No no no, I actually had it planned months ahead what I wanted to bake for his birthday cake. I can only go with chocolate flavor since that is his favorite....nothing wrong since I love chocolate too. ;)) I remembered I ate this really yummy chocolate cake at a blogger gathering last year. 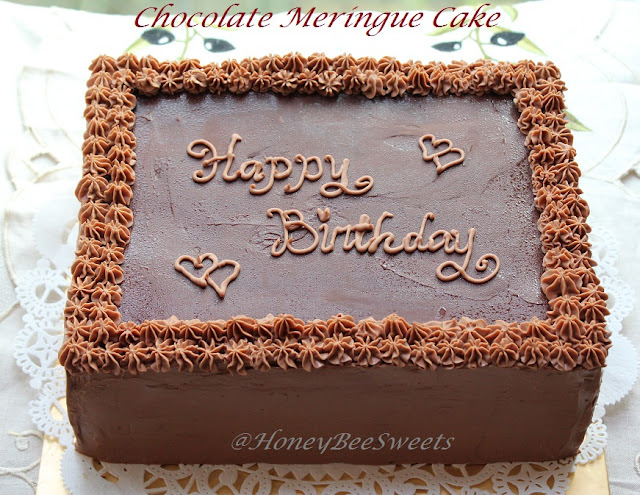 It's call Chocolate Meringue Cake shared with us from Doris of Tested & Tasted. Thanks Doris!! It left a wonderful impression and I knew I had to replicate it in my own kitchen. I modified Doris's recipe to make 1.5X of the recipe, plus I wanted a taller cake too. 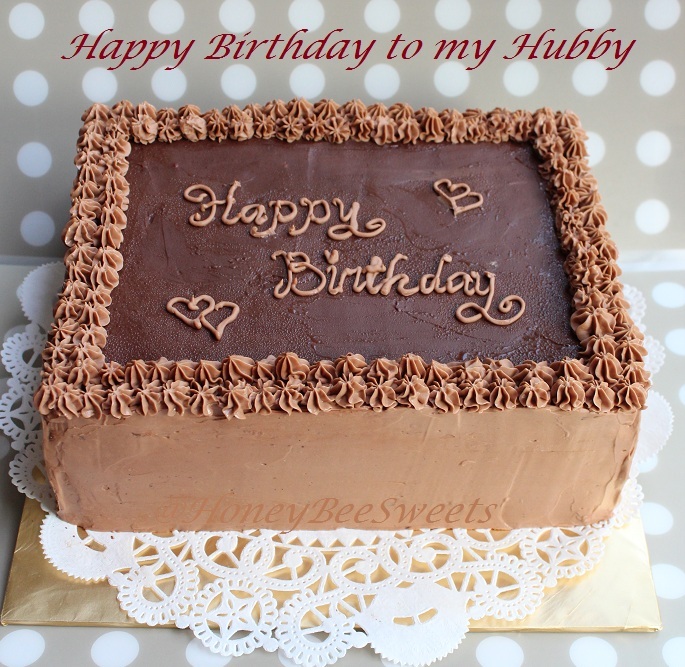 ;) Plus I used my own chocolate swiss roll recipe as I really love that cake texture. So I will repost my recipe here for reference. My cake came to be 10" by 7" and approximately 4" tall. 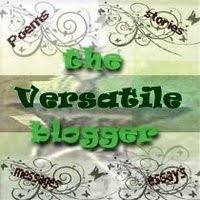 If you prefer a smaller version, please refer to Doris's blog. Once baked, let cool and cut half. Each rectangle should be 10"x7". *Note that I reserved about 1/2 cup of chocolate ganache to mix with 1cup of vanilla Swiss Meringue buttercream. 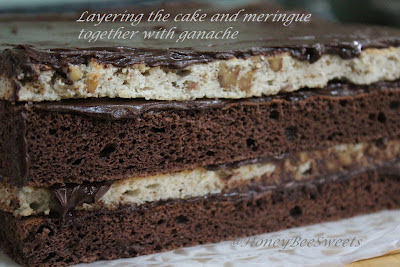 (used when assembling the cake later) But if you prefer not to cover the side of the cake, you can use up all the ganache when layering. Chopped and place the chocolate in a large mixing bowl. Heat up the heavy cream and butter until butter melted and the mixture almost boil. Gently pour the cream mixture over the chocolate and let seat for 5 minutes untouched. After 5 mins, gently stir mixture together until it comes to a nice shiny smooth ganache. 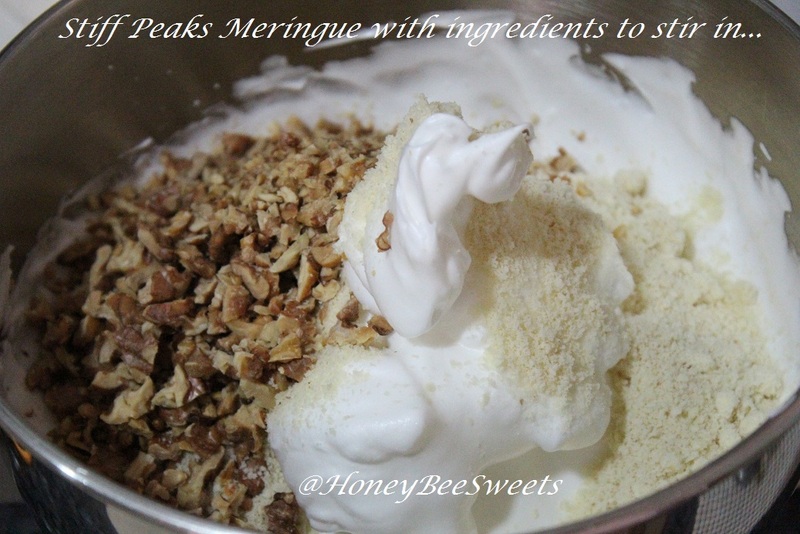 Beat the egg whites until foamy, then continue to beat and gradually add in the sugar and beat till stiff peaks. Then stir in the chopped walnuts, almond meal and sifted bread flour, stir gently till everything is combined without deflating the meringue. Preheat the oven to 180C. Grease and line a 14" x 10" baking tray. 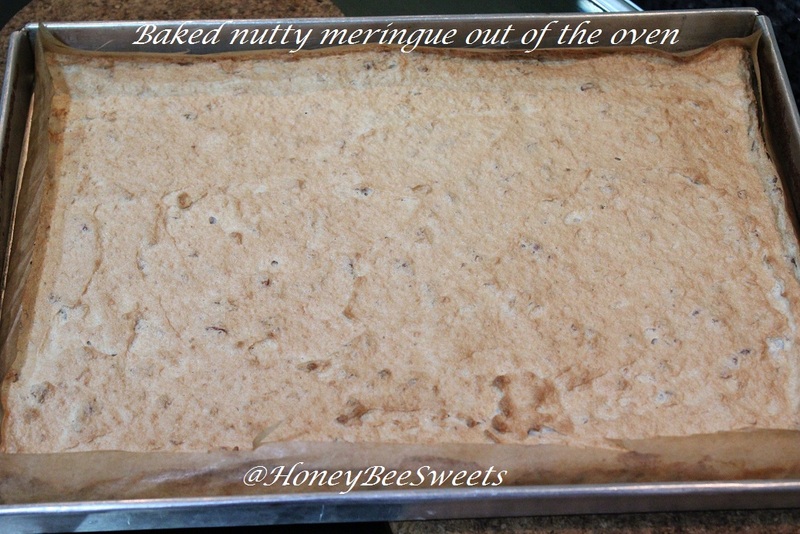 Gently spread the nut meringue onto the prepared tray. Bake in the oven for 15-18mins till light golden brown in colour. 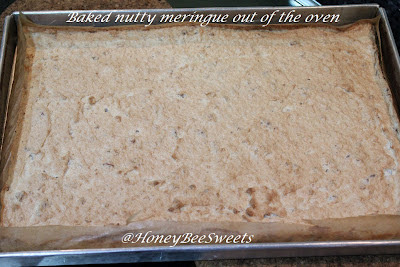 Once cooled, slice the nutty meringue into 2 rectangles, each measures 10" by 7". Place one layer of the chocolate sponge cake as the first base. Then spread a layer of chilled chocolate ganache over the sponge. Next top it with one half do the nut meringue. 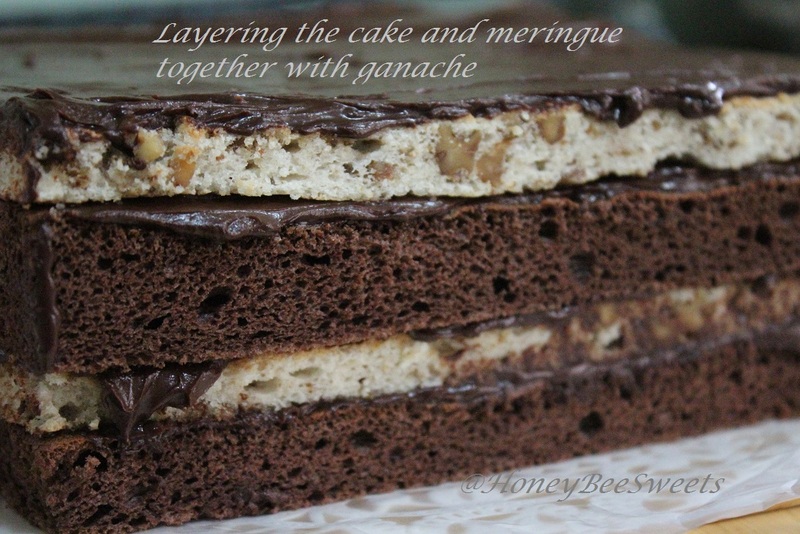 Again spread a layer of chocolate ganache over the top. Repeat this step until you used up all the layers. Then trim of the sides of the cake to make it neater. 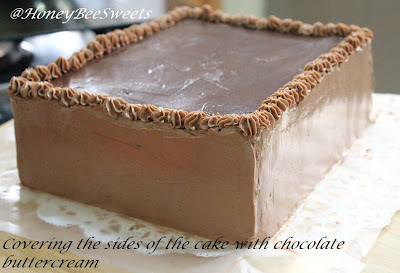 Spread the chocolate buttercream around the four sides of the cake to cover up the layer. Note that you can opt not to do this step, but I wanted a neater look. At this point, you can choose to dust the top of the cake with cocoa powder or decorate the cake as desired. Like I said before, I'm not a fan of eating powdery bitter cocoa powder, I left it out. I really like how the soft sponge cake and the nutty meringue come together and gave a really nice texture. You might be wondering if the meringue tasted like a meringue cookie...oh no, it almost tasted like a soft sponge cake bursting with nutty flavor. Okay folks, gonna end my post here. Will try to rush out another 2 more posts before the month ends. *fingers crossed* Have a great one all! Weekend is here again and it will be quite an exciting one for me and my family since we have visitors from overseas coming today. It's actually a close friend of mine whom I had the pleasure to know when I was staying in KL. In fact, she is the first friend I know when I was there! Our friendship didn't dampen even when I had moved back to Singapore for more then 2 years now. Really hope we can cherish and enjoy this friendship as long as we can, because it is not easy to find one as we all know. Looking forward to seeing them later! In a saute pan, add the butter and heat up at medium low heat. Add the salmon and pan fry till golden brown. Should not take long, probably 5 minutes, depending on your salmon piece size. Once the salmon is cooked, remove from the pan and let cool for 5 minutes. Then flake the fish, remove bones and skin if there is. In a big pot, boil some water for cooking the spaghetti. Cook the pasta till al-dente and drain out. Set aside for use later. 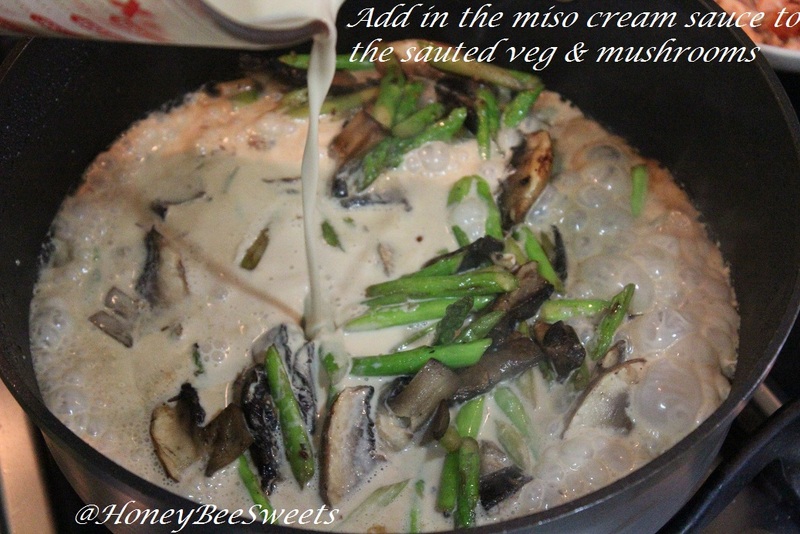 To make the miso cream sauce, heat the cream in the microwave oven for a minute and then stir in the miso paste. Whisk if needed till well combined. In another pot, add in 1 tsp oilve oil, and saute the garlic slices till fragrant. Then add in the asparagus, cook for a minute then add in the portabella. Stir for a while till the mushrooms have wilted a little. Pour in the miso cream mixture and stir till well combined. 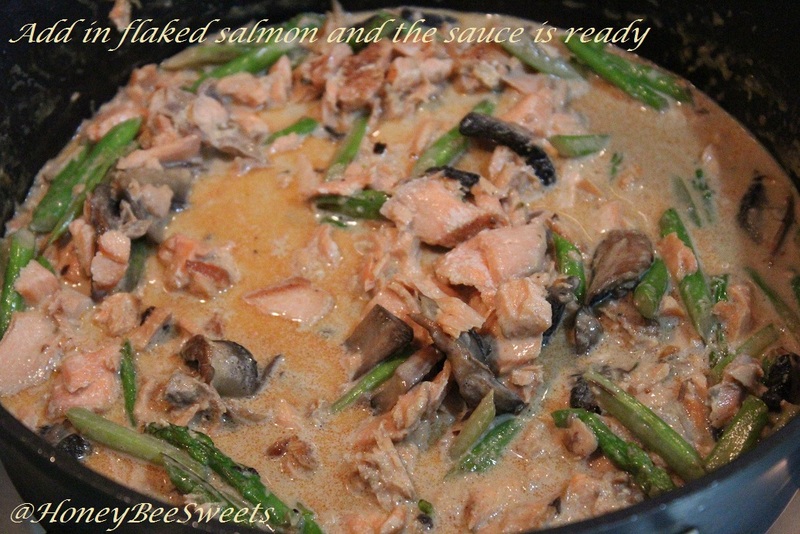 Lastly, add in the flaked salmon and stir well. Add in the pasta as before you are serving, stir till well combined and dish up and eat while it is still warm. Bon appetit! A simple yet delicious meal to prepare for your love ones. 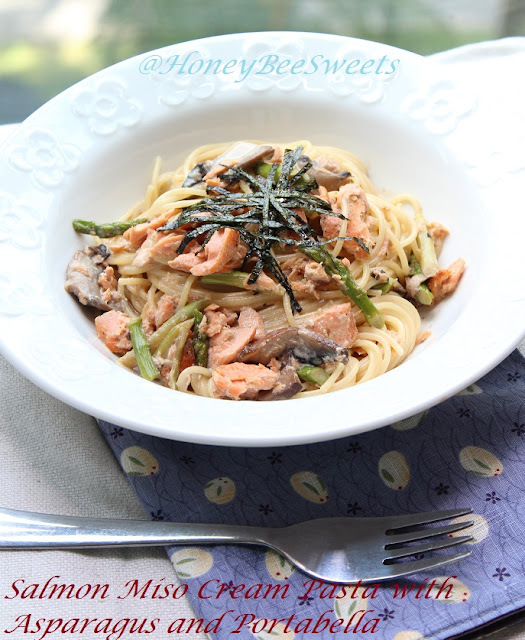 The salty miso mellows out with the cream and it also brings out the sweetness of the asparagus. It all went well with the musky taste of the portabella mushrooms...simply divine! My girl whom is not too fond of asparagus, ate up the whole plate with no complains and said it's the best pasta ever, lol! 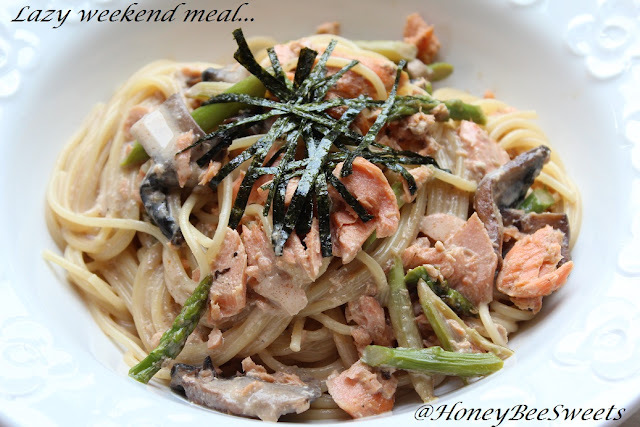 Hope this post will inspire you to try it out and cook for your dear ones this weekend. ;) Cheers! I am actually quite excited about the coming mooncake festival. Reason being I can make some fancy mooncakes again! I love making them but don't really like eating them, haha! But I do eat those that I made since I only use filling with reduced sugar. :) I even took up orders from my neighbours just to satisfy my need to make them! Weird I know, but I guess if you are like me, enjoy playing around in the kitchen, you will know what I mean. 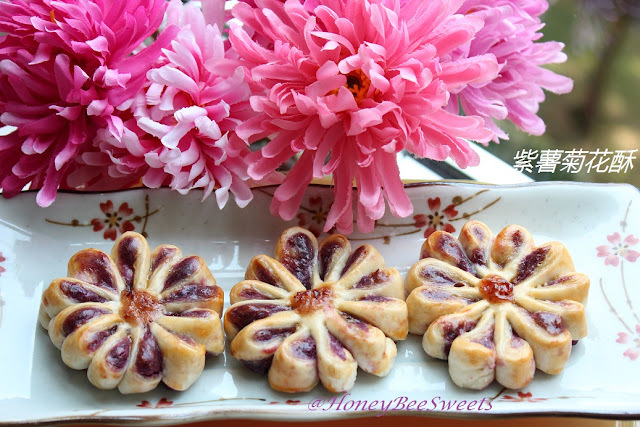 :) I need to bake around 30 mooncakes just this week alone...so wish me luck! Back to today's post, it's actually one that I had hold off posting for more then 2 months. Just didn't have the right timing plus participating in food fest or themes, so put it off till now. 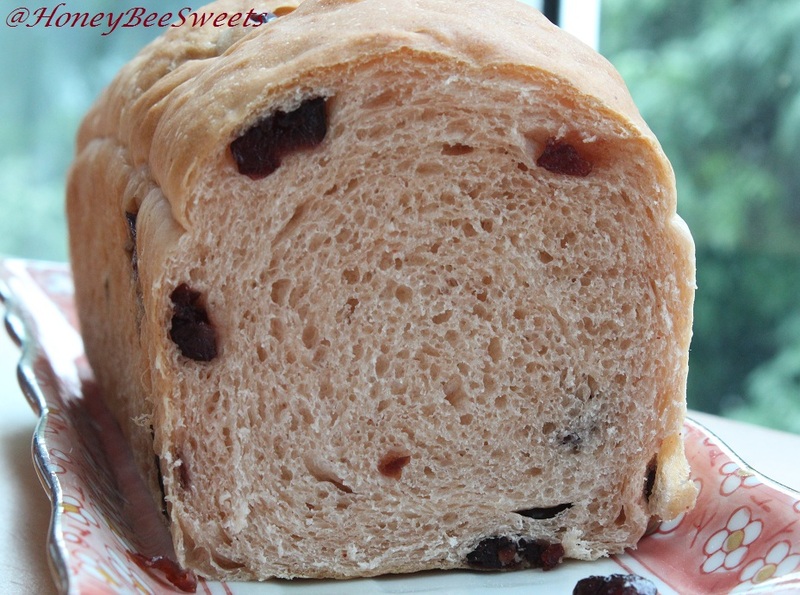 I had been saying I wanted to use red wine yeast to cook or bake something for awhile. So here it is! 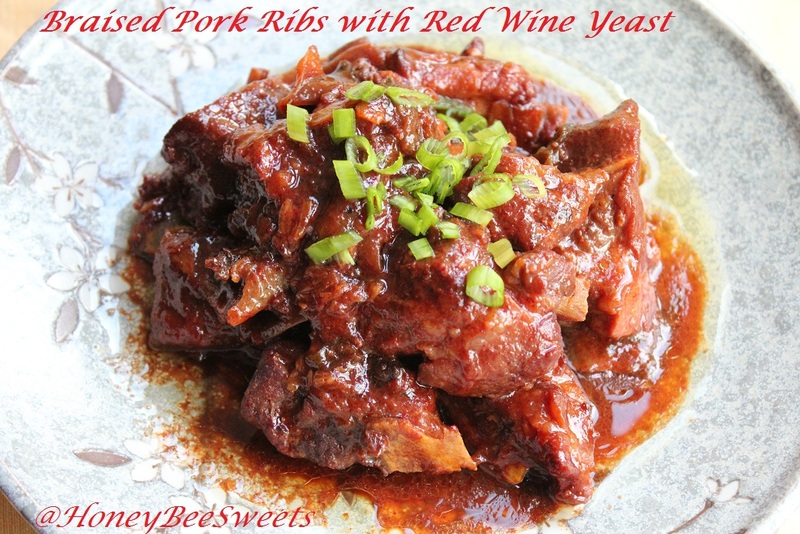 Braised Pork Ribs with red rice wine(紅麴醬). 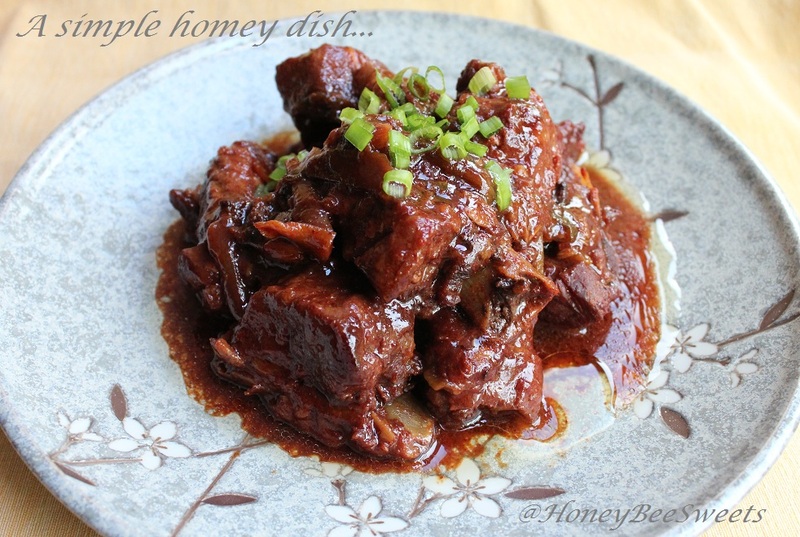 I got this braised pork rib recipe from Carol 自在生活. It was easy to prepare and ingredients were not hard to gather. 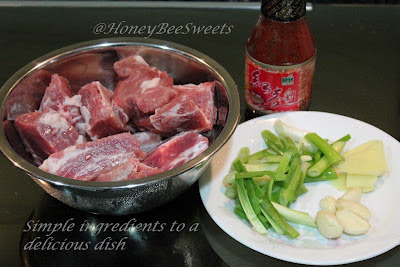 Combine the soy sauce and pork ribs to marinate. Cover and chill in the fridge up to an hour before cooking. In a small frying pot, add about 200ml of cooking oil and heat up at medium fire. Add the pork ribs and fry till slightly golden brown. Don't have to be throughly cooked through. Dish up and drain on paper towel. Remove most of the cooking oil, leaving about 2 tsp left in the pot. Add in the garlic, ginder and green onion in. Cook till fragrant, about 4-5 minutes. Add in the pork ribs andstir fry for a couple minutes. Add in the red rice wine, salt, sugar and stock. Stir to mix and cook till boil. 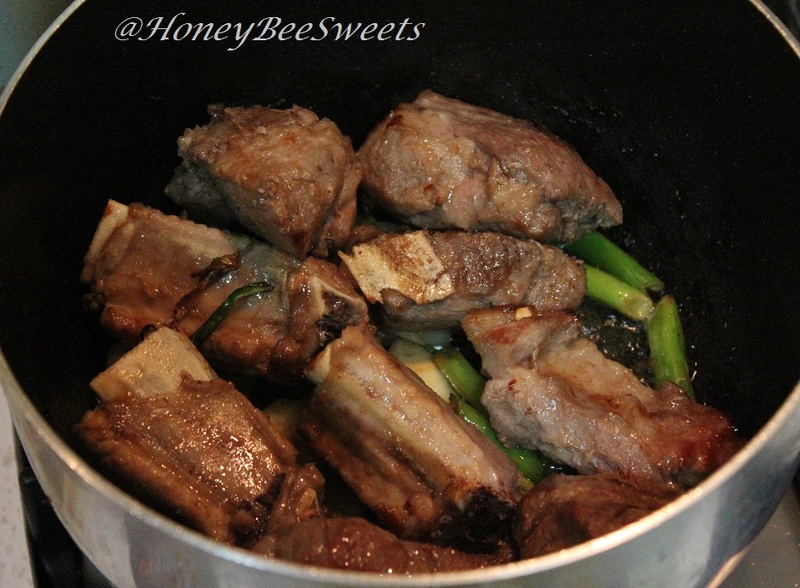 Once boil, lower the fire to low, cover and simmer for about 30-35 minutes or till the meat is tender. The dough was pretty easy to handle. 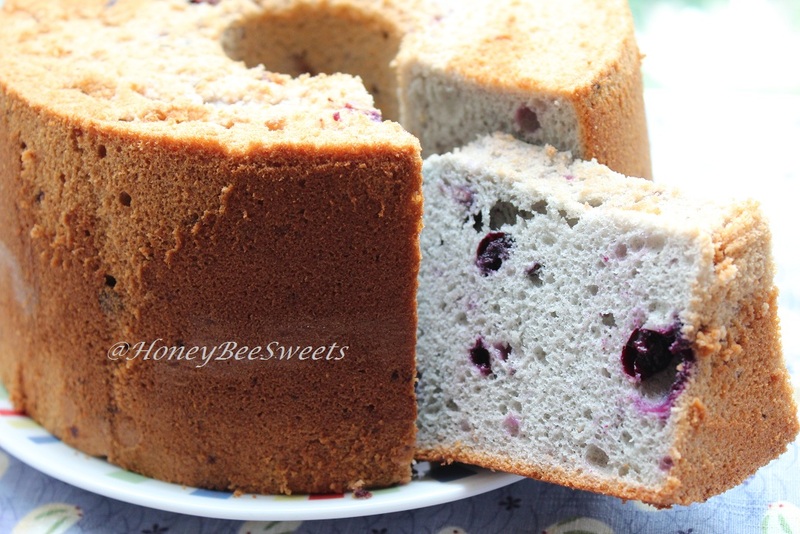 And instead of leaving it plain like what the original recipe calls, I used sweetened cream cheese as the fillinf, somehow a good match with the tangy dried cranberries. Note that I made 1.5 portion of the recipe. Knead the dough till it is not sticky and add the butter in Set B and continue to knead. Knead till it reaches the window panel, about 20-25 minutes on my KA. Punch out the air in the proofed dough. Divide the dough into 2 equal portions and let rest for 10 mins before shaping. I used half of the dough to make buns, so I divided the 1/2 portion of the dough into 4 equal balls. 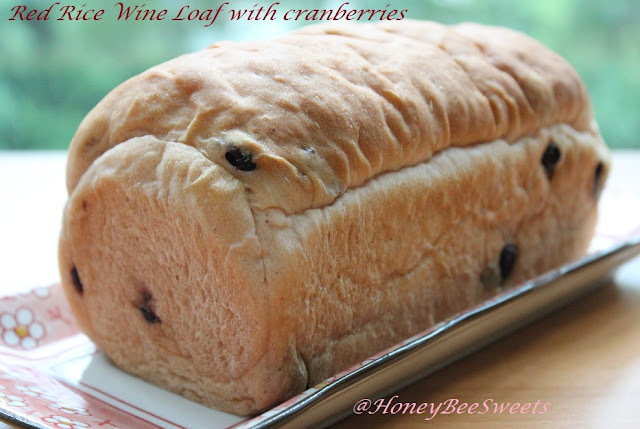 While the othe half I rolled it like a swiss roll and bake it in a small loaf tin. 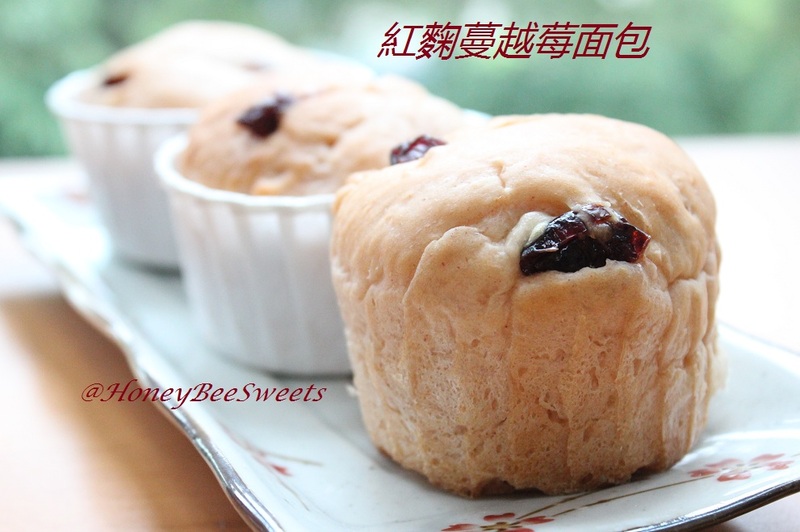 Fill the 4 equal balls with the sweetened cream cheese (about 50g) and seal it nicely. 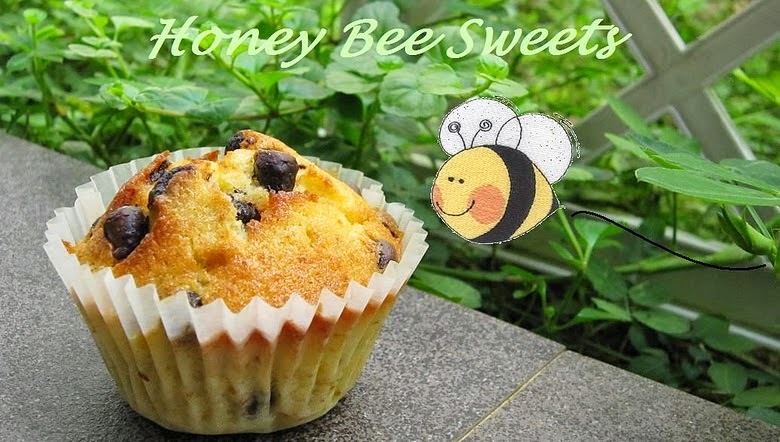 Place into a muffin cup or any container you prefer. Repeat till all the dough portions are filled. Let the dough proof for another hour and preheat the oven to 175C. Bake the buns for 15 mins and the small loaf for 20-25 minutes. Once done, remove from oven and let cool completely on the rack. Okay, signing off now, have a good week all! Another school term has ended. Although I welcome this short school break now, I too have mix feelings about the coming year end events. Year end exams, a family wedding, birthdays, oversea visitors and a trip away. It just spells busy busy busy. :P Nevertheless, some of these events are really much awaited for, so I'm really looking forward. Although we didn't plan for anything big this one week break, I really don't mind these "unplanned" days. Seating around sipping tea or just lazing on the sofa watching Food Network, haha! 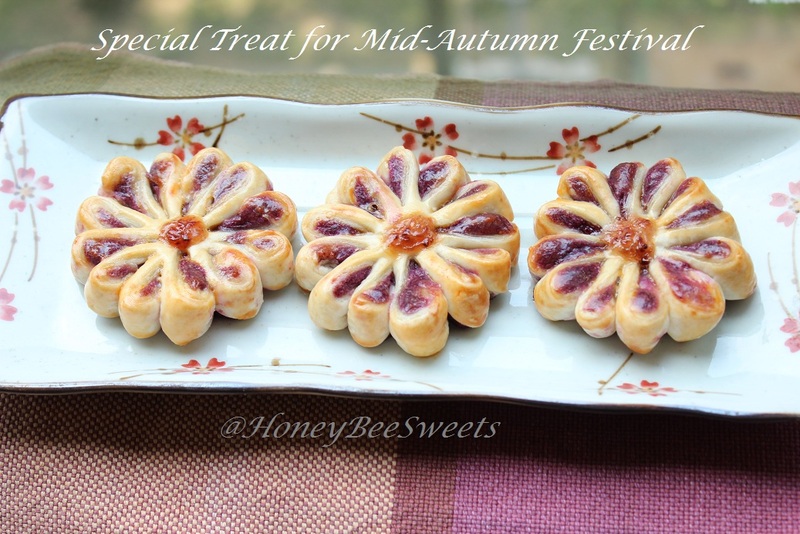 Nevertheless, I am still baking away in the kitchen, and today's post is just one of them bakes which I did last month. ;) An all natural blueberry chiffon cake. Why all natural? Well I didn't use baking powder or cream of tartar, so it's "chemical" free! 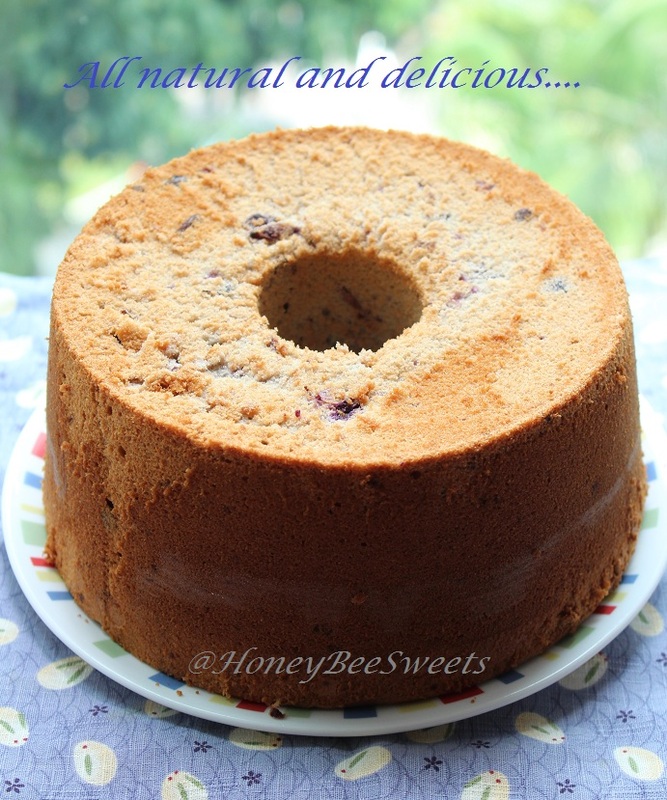 I think many people out there believe that it is a must to add in baking powder or some levening agent in order to achieve a nice tall chiffon cake. Oh no, it's not necessarily true....I'm here to prove otherwise. ;) In fact I have not used any levening agent for my chiffons for quite awhile now. I am sure many bakers that bakes chiffons regularily will agree with me on this; it is really a matter of beating your whites to the right consistency and baking at the correct temperature. Of course many other details like using a trusty recipe, the folding of the batter and cooling the cake itself can also incur the quality of the end product. But I believe through practice and knowing your techniques well will naturally make baking a chiffon a real breeze. *Note: Place 100g of fresh blueberry, 1 tsp fresh lemon juice and 2-3 tbsp caster suagr in a saucepan and cook mixture at low heat. Stir constantly and cook till the blueberries have burst and ozzed out it's juices. Once it thickens about 8 minutes, remove from fire and let cool for use later. In another mixing bowl, add in all the egg white and beat using a mixer at medium speed till foamy. Without stopping the mixer, gradually add in the sugar and beat till stiff peaks. Turn the mixer to lowest speed, add in corn flour and beat till combined. Pour the batter into a tube pan (no grease or non stick please) and place in the preheated oven to bake for 30 to 35 minutes. Tester comes out clean and it's ready. 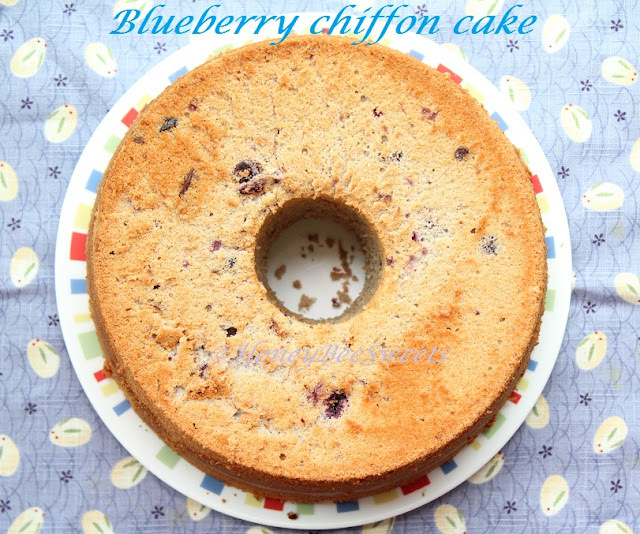 I am so glad my blueberry chiffon turned out purplish blue! I was kinda worried it'll be greyish and dull. I believe the lemon juice in the compote might have helped kept the colour. ;) And as you can see the texture of the chiffon, it is soft and fluff...yummy. ;) I believe you can use this same recipe with most of the summer berries, be it strawberries or rasphberries. 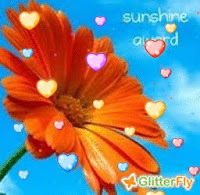 Have a great day you all! Cheers!